Home » Is Now the Time to Get Out of Dividend-Paying Stocks? 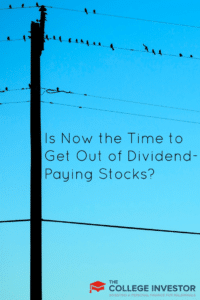 Unless you have been living under a rock the last several years, dividend-paying stocks have been all the rage and it is certainly understandable. With the way the Fed has kept rates low we have been hard-pressed to find somewhere to park money and make any decent return. The usual suspects of CDs, bonds, and the like have been giving paltry returns and unless you want to tie your money up for several years, inflation could cause you to lose money on those options. 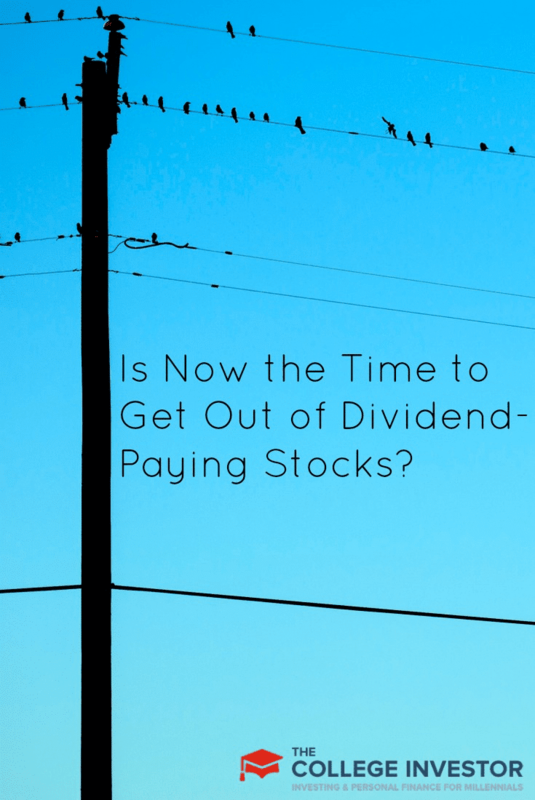 As a result, investors have been leaping into solid dividend-paying stocks as it’s fairly easy to find stocks that pay at least 3% if not more in the form of dividends. However, a recent — but growing — concern over Fed actions is beginning to cause movement out of these dividend-paying stocks. This begs the question of whether or not giving up on dividend-paying stocks is the right thing to do. Left with nowhere to really place money earmarked specifically for income generation, many investors were left with dividend-paying stocks as the best option. This helped create somewhat of a herd mentality as many were flocking to dividend stocks in order to meet that need for production. When looking at the landscape of dividend-paying stocks it is understandable, on one level, why many investors would choose to go that route. With the various sectors that generally produce dividend payers ranging from defensive stocks to telecommunications to utilities, you can generally find some reputable stocks that will help you see that income production — without necessarily taking on a lot of risk like you would with that of a tech stock, generally speaking. However, as we are seeing somewhat of a changing landscape in the market, the perceived “safety” found in these high dividend-paying stocks is waning as many take a significant hit on them. As JT wrote last week, this is not surprising and some of these sectors might be ones that you’d want to consider cutting back on in order to reduce the risk that increased rates might play on the prices of some dividend-paying stocks. As I read in this article from CNN Money last week, the change reflects an evolving investor appetite toward growth-related stocks, as well as other sectors. It basically cited that retail investors are experiencing a change in their risk tolerance toward growth and slightly away from increased income production. The article went on to state, briefly, that investors have become more optimistic about growth prospects in the second half of the year and that a lot of growth seems to be occurring in the big bank area . . . think stocks like Bank of America (BAC), Goldman Sachs (GS), and JP Morgan (JPM). The argument is that the rising rates will make it more beneficial for the big banks to loan to consumers and thus become more profitable, though I do not necessarily think consumers will be flocking to borrow at increased rates. That said, I do think there is potential in the banking sector looking at the amount of cash many have been sitting on and they will at some point start acting to improve their profitability. Ultimately, this movement out of dividend-paying stocks is indicative of a growing concern over what the Fed’s actions, or inactions, might have on the market as a whole. All that to say, I do not believe one bit that investors need to shy away from dividend-paying stocks, but rather should be mindful about what role increased rates might have on them. They should also be on the lookout for other possibilities if income production is still of importance to them. As JT pointed out last week, there are still viable options out there in terms of dividends, though you’ll want to be leery of utility or REIT stocks as they have been taking a significant hit over the last few weeks. It can be easy to see the outflow of money from solid dividend-paying stocks and want to jump ship. That is perfectly understandable as some sectors are down as much as 5% or 6% over the last month. I hate to lose money in the stock market and will do anything I can to avoid it. That said, you should only take action if that fits in with your overall investment plan and your goals. This requires you to stay on top of your investments and be mindful of what is going on in the news without allowing your emotions to get the best of you and make an investing decision you would not make otherwise. Also, this is as good a time as any to take inventory of your risk tolerance and balance that against what is going on in the stock market. As I wrote last month in “The Problem Behind Sell in May and Go Away,” it can be easy to become swept up in the talk and follow what the herd is doing without giving much thought to it. When you invest in stocks it can be easy to allow emotions to get the best of you and that is why having a long-term view of your investing is vital. While I would generally stay away from utilities or REITs right now, I know that the decline will not last forever which will create a buying opportunity at some point where you can go in and buy shares at a discounted price to hopefully ride back up. Ultimately, this outflow from dividend-paying stocks and the recent down days in the stock market point us to the need to be able to balance taking action with our portfolios without also risking our overall long-term investing goals. What is your take on the outflow from dividend-paying stocks? Are you sitting firm, bailing out, or looking for an opportunity to get in at a discounted price? Editor’s Note: This article contains a lot of time-sensitive material. Be sure to seek the advice of a financial advisor for current market analysis and advice. If you’re in it for the long haul like I am then I wouldn’t be getting out of dividend stocks as a whole. With REITs/Utilities it could be prudent to do so since they are much more sensitive to interest rates. If you do try to rotate out of dividend stocks where do you put your money? The treasury bond rates are still pathetic even with potential increases. I’m still leery of bond mutual funds because I think they will start to see some losses not counting the effects of inflation. As long as the underlying business is still doing great I’ll continue to invest in dividend growth stocks. I agree JC, I would not be getting out of them as a whole either. I just think that it causes to be aware of what is going on in the market and not jumping ship, but also possibly waiting to get in at some discounted prices.Like you said, there are very few (if any) places to get equivalent return for your money. I think everything depends on why you went into dividend stocks or funds. If you are a retiree, you may need the cash flow. If it was a safe haven, you may want to rethink your decision. I have never been a fan of dividend stocks/funds because my investing strategy has been growth. That’s a great point KC, as I do think it goes back to why you went into them in the first place. I have a few in my portfolio, but have been leaning more heavily towards growth lately. If you’re in for a long haul, wouldn’t this be a buying opportunity? The dividend yield will get better as the price drops. I stopped out of a few stocks and I’m looking for good dividend investment opportunities. It definitely has the potential to be, I just think it requires due diligence to make sure they’re good opportunities. I know that I have some sitting on the side for this very reason and will be looking for buying opportunities. It can be a good way to build an income stream, especially if you get into some good dividend paying stocks. Growth stocks, on the other hand, can gain more, but they also have (in general) their own set of risks. It’s all about what your goals and plans are with your portfolio and once determining that going after it. I think dividend stocks continue to be a safe area for investors in most risk situations. I use vanguard ETFs that have stronger dividend yields for low cost diversification. While they’ve had some profit taking recently, I’m convinced that there’s some uncertainty with fed rates, and that dividends will be a safer place in this time. I think some can be, though an eye does need to be kept towards the Fed posturing and being aware of that. I am still leery or REITs as well as a few others, though there will come a time that you should be able to see some good opportunities to get in them – till will only tell though. My reasons for buying dividend stocks haven’t changed so I won’t be getting out of them. I’m not too concerned about their growth prospects. Since I started invested in late 2008 when the stock market was way down most of my dividend stocks have had some pretty big increases in price. If dividend stocks stop being popular then I should be able to get more at a better price. I imagine that you have seen them come back quite well considering you bought in during 2008. There should definitely be some good opportunities if there does continue to be an outflow from them. I think its dangerous to follow the herd or to act based upon their actions. The successful people I admire got there by staying a step or six ahead of the herd. I don’t see any reason to change strategy right now. If you’ve been with dividend stocks, there is nothing I can see in the markets that shows they’re going to start underperforming compared to the rest of the market.